The Way of the Roses cycle route is 170 miles long and can be cycled in both directions from Morecambe in Lancashire and ending on the east coast at Bridlington in the East Riding of Yorkshire. Some big hills between Settle and Brimham Rocks. The roads are mainly minor but there are a few main roads. 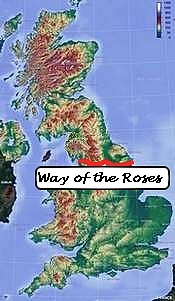 The Way of the Roses can be a wonderful adventure. There is so much to see and do along the journey, passing through many historical places and beautiful countryside with cycle friendly accommodation along the way. Copyright © 2004 - 2019 BvF Web. All Rights Reserved. 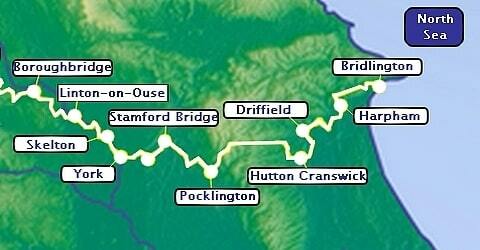 C2C (Coast to Coast), Hadrian's Cycleway, Way of the Roses, Coast & Castles South, Devon Coast to Coast.